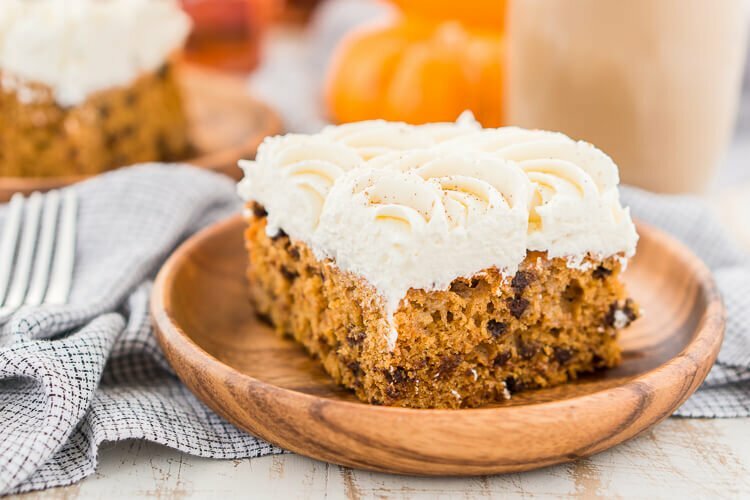 This Pumpkin Chocolate Chip Poke Cake is a deliciously seasonal dessert that’s great for potlucks and family gatherings. 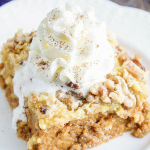 A dense pumpkin spice cake soaked in sweetened condensed milk and loaded with chocolate chips is topped with a fluffy cheesecake frosting and dusted with cinnamon! It’s pumpkin season, guys! 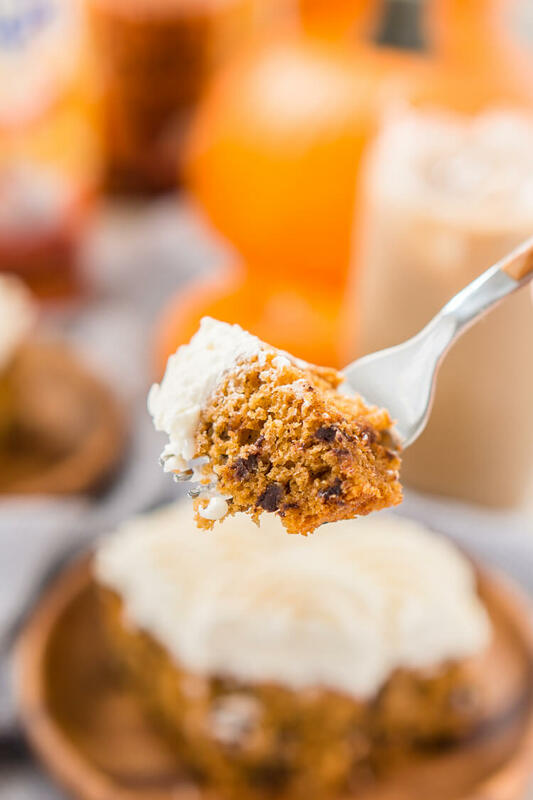 If you’re anything like me, you get your fill of pumpkin spice and everything nice by adding this festive flavor to just about everything: cakes, muffins, bread, coffee, cookies, you name it! Plus, in New England, fall is the shortest and arguably the most beautiful season that we have. With only a few weeks of eye-popping foliage and mild weather, it’s important to fit as many festivities and flavors into those short weeks as possible.I think that most New Englanders wish that autumn was a little bit longer. But since it’s so fleeting, we know how to appreciate each crisp, sunny fall day as it comes. I think that most New Englanders wish that autumn was a little bit longer. But since it’s so fleeting, we know how to appreciate each crisp, sunny fall day as it comes. But this time of year is when things start to get really busy. All sorts of fall traditions, like apple picking, pumpkin carving, and of course, seasonal baking start to occupy what little spare time I have. Then I begin to realize that a whirlwind of holidays is on the horizon, and I always promise myself that somehow, this year, I’ll start preparing earlier so that I’m not scrambling around to get things done last minute. Needless to say, it’s this time of year that my caffeine tolerance tends to skyrocket! With temperatures that are in between being too hot and too cold (in other words, perfect), I’m still not ready to give up drinking iced coffee, my warm weather addiction. While early autumn mornings can certainly get chilly, by late morning, it’s warm enough to comfortably enjoy a scenic hike or running errands around town. Plus, I refuse to drink hot coffee until temperatures dip below freezing. It’s not winter yet, people! Still, I make sure to stay true to the season by adding a splash of—you guessed it!— pumpkin spice flavor to my iced coffee. 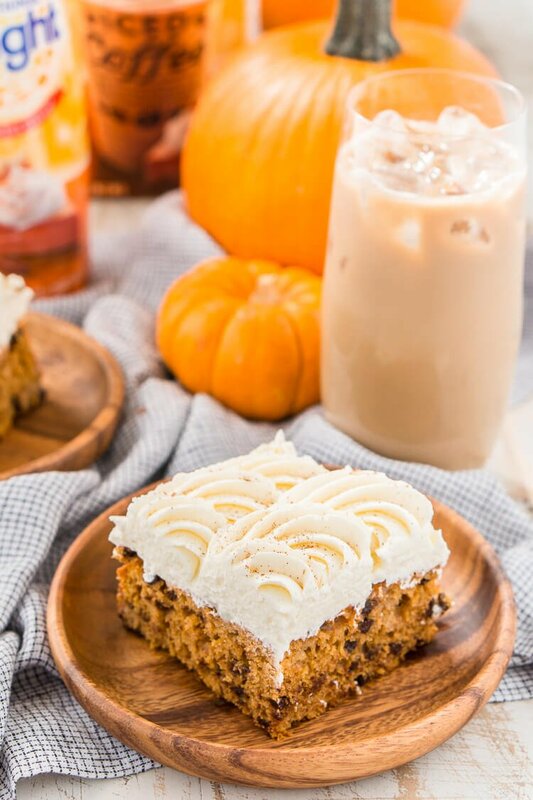 Not wanting to make my drive-thru coffee splurge a daily habit, I began searching for ways to enjoy this nostalgic fall flavor at home. That’s when I discovered that International Delight makes Pumpkin Pie Spice Iced Coffee and Pumpkin Pie Spice Creamer. Obviously, I had to try them both. 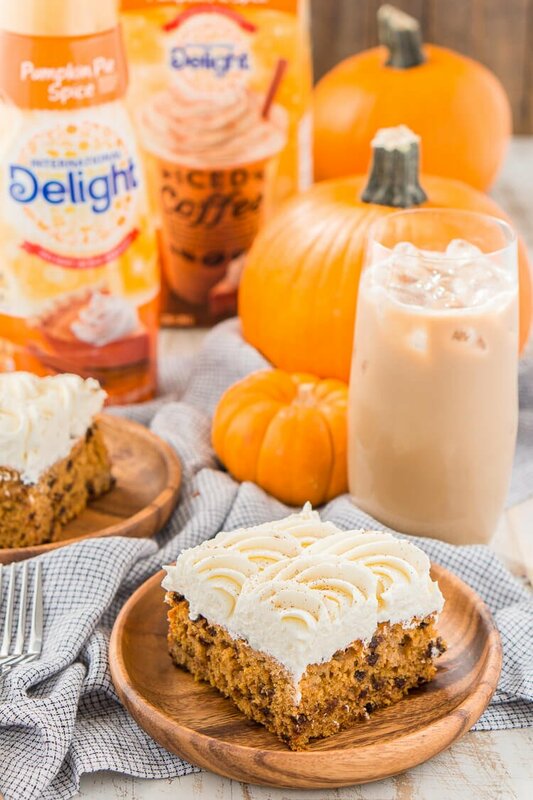 I’m happy to say that these new pumpkin spice products did not disappoint! What’s more, this tasty creamer can be added to more than just coffee. In my search for ingredients that do “double-duty,” I’ve discovered that creamers make excellent additions to cake recipes. This “secret” ingredient makes baked goods more flavorful and moist. 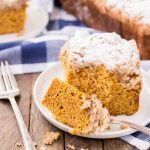 You may remember my Vanilla Pumpkin Coffee Cake recipe, and it turned out so well, I decided to create a new recipe using the Pumpkin Pie Spice Creamer. 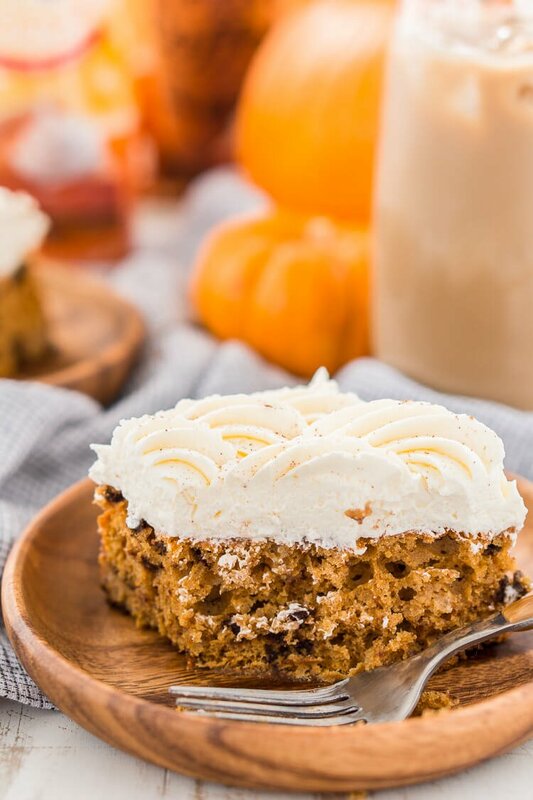 Introducing: Pumpkin Chocolate Chip Poke Cake. This indulgent treat uses a simple cake mix as its base. 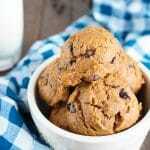 For added richness and texture, I mix mini chocolate chips into the batter. But the cheesecake whipped frosting is—quite literally—the icing on top of the cake! Light, fluffy, and smooth, it’s the perfect compliment to the moist, dense pumpkin cake. 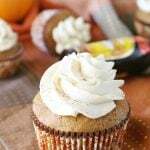 Pumpkin, chocolate, and fluffy cheesecake frosting; need I say more? 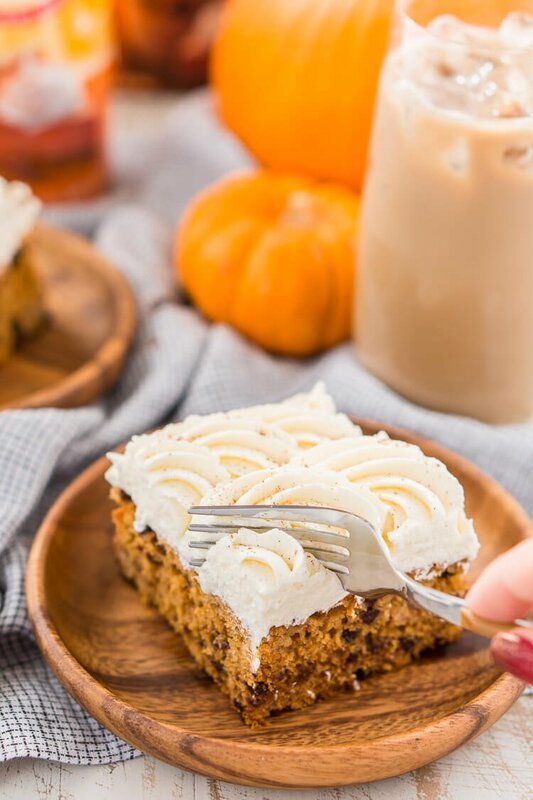 Keep in mind that pumpkin cakes make great alternatives to traditional pumpkin pies this time of year. 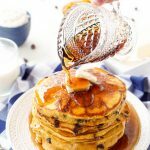 There are so many different recipes; it’s easy to bring something fresh and exciting to any festive gathering while still giving a nod to everyone’s favorite flavor of the season. Plus, sheet cakes like this travel well and are easy to share, making them a great contribution to fall potluck dinners. 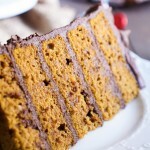 Your pumpkin cake recipe may even play a starring role on the dessert table at Thanksgiving. 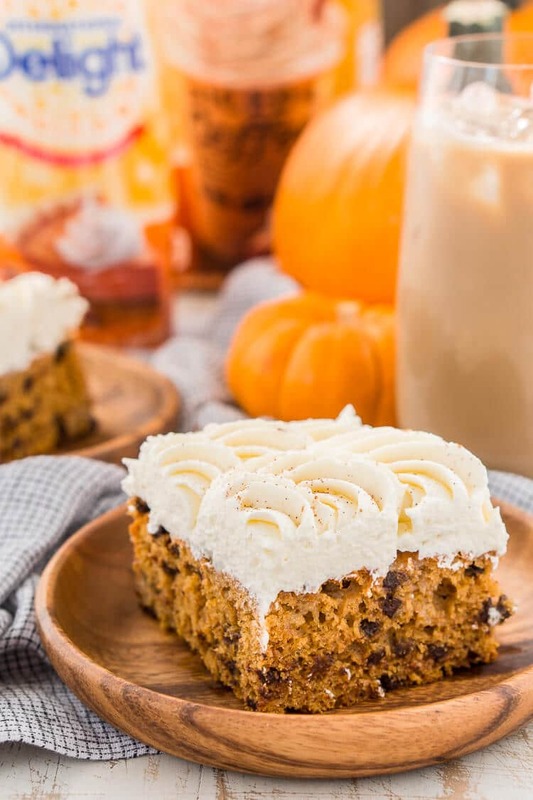 But who’s to say that Pumpkin Chocolate Chip Poke Cake is only for dessert? I think I’ll indulge in a scrumptious piece for breakfast, and maybe as an afternoon pick-me-up after a busy morning. 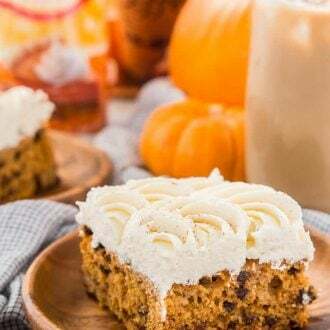 A sweet slice accompanied by a refreshing glass of Pumpkin Pie Spice Iced Coffee sounds like the perfect way to recharge and make the most out of the rest of these gorgeous fall days! 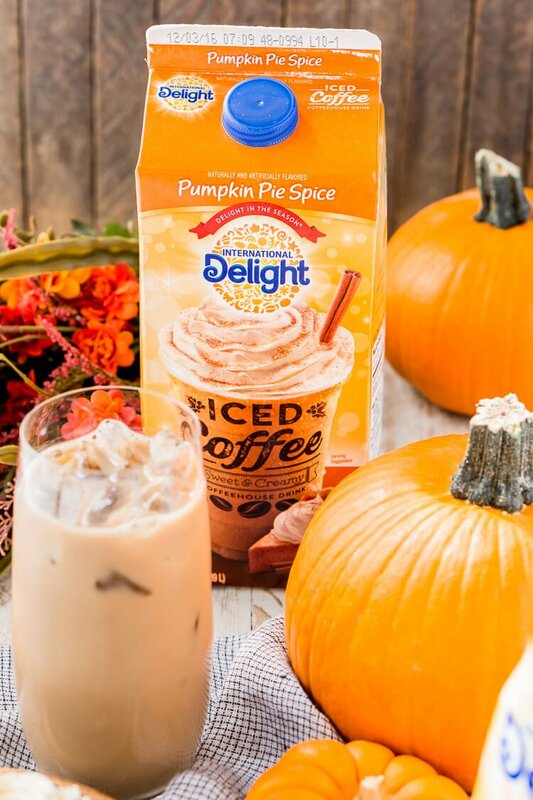 Follow International Delight on Facebook, Pinterest, Instagram, and Twitter and don’t forget to check out their website or use their product locator to find some Pumpkin Spice flavored products near you! Preheat oven to 350 degrees F. Grease a 9 x 13-inch cake pan with cooking spray and set aside. 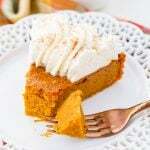 Combine cake mix, pumpkin spice pudding mix, pumpkin puree, pumpkin pie spice, eggs, creamer, and oil in a large bowl or stand mixer and beat until combined. Mix in the chocolate chips and then spread the batter out in the prepared baking pan. Bake for 38-43 minutes until toothpick comes clean from center. Let cool in the pan on a cooling rack for an hour or so. Used a skewer or wooden spoon handle to poke holes in the cake, pour the sweetened condensed milk over the cake and spread around so it's completely covered. Let set for at least 1 hour to soak. Prepare frosting just before serving or heading to the party by whipping the frosting ingredients together in a large bowl or stand mixer fitted with a whisk attachment. Beat on medium-high speed for about 3 minutes until frosting is light and fluffy. Spread frosting over the top of the prepared can and dust with cinnamon if desired. *if pumpkin pie pudding cannot be found, use vanilla instead.